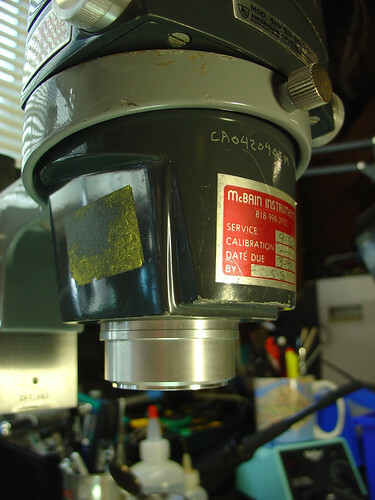 Today, while I was tweaking the microscope that I use for surface mount soldering, I realized that I have collected quite a bit of hard to find information about this circa~1975 model 569 American Optical StereoStar Stereoscopic Zoom Microscope (say that three times fast!). So, I made a wiki page and put it all online. StereoStar owners, rejoice! Why do I need a microscope for SMT? The single biggest challenge to doing “real” SMT work (0805 or smaller components and fine lead pitch ICs) at home is being able to actually see what you are doing. 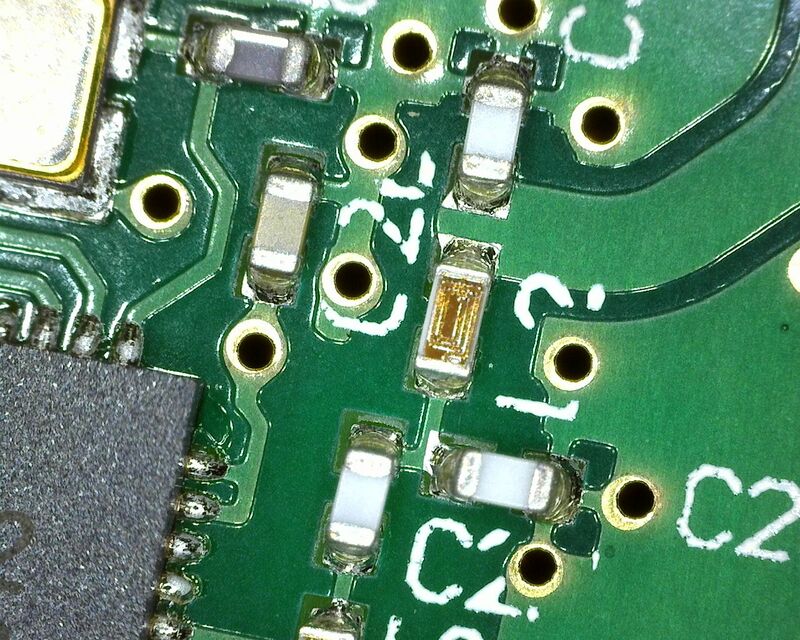 I know that there are many hobbyists (and maybe even some budget-conscious professionals) who will disagree with me, but I wouldn’t dream of working with surface mount components without using a microscope. 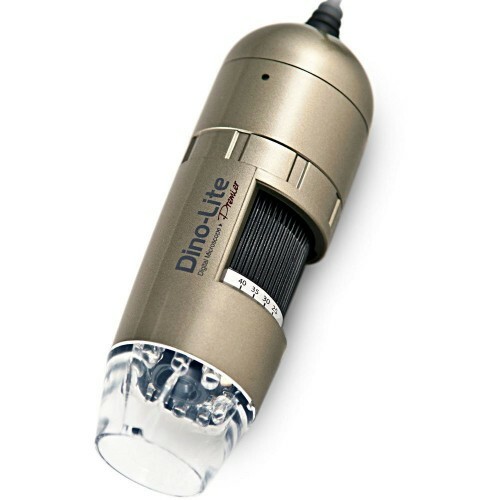 I’ve tried many alternatives, including a 10X handheld triplet loupe, a magnifier ring light, even a nausea-inducing magnifying visor, and none of these even come close. 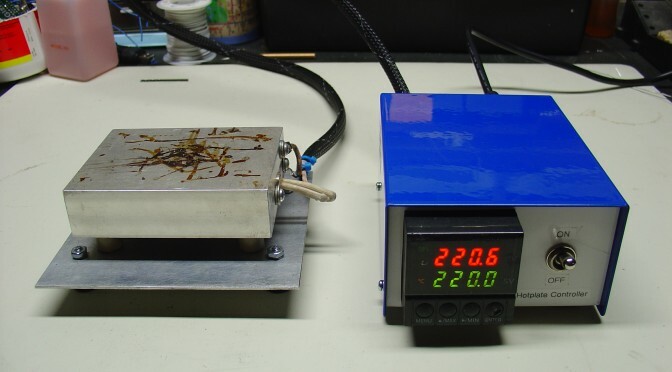 In case I haven’t made myself clear: I would rather solder SMT’s with a 150W soldering gun than with anything other than a decent stereo microscope. In January of this year, I scored a stereo zoom microscope on eBay. 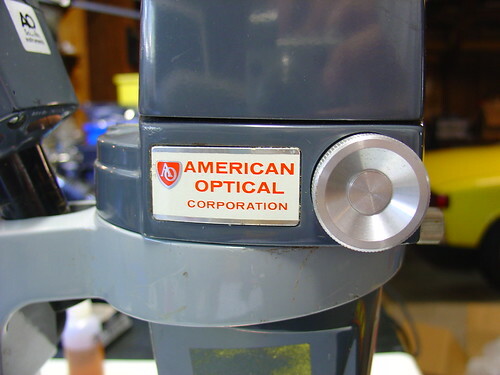 While my scope is far from state of the art (it’s a “vintage” American Optical model 569) the optics are fantastic and it quickly became the most prized piece of equipment in my shop. Here’s a photo of the scope shortly after I added it to my lab, for more photos and information about it, see my original post. The magnification range of 7-30X was great for working on a few tightly grouped 0805 or smaller components, but was too high for general PCB work. A typical BGA package was larger than the field of view. 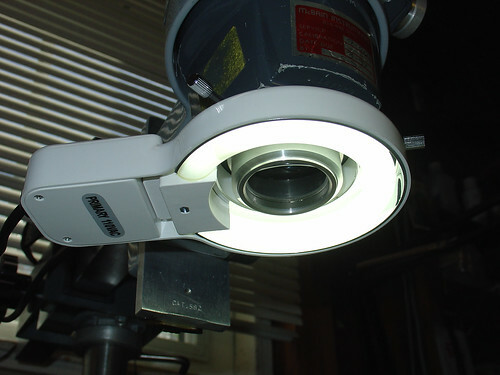 The included incandescent projector-style illuminator (shown piggybacked on the scope in the photo above) could only be placed in a limited set of positions and did not have adjustable focus – it made a nice, bright spot in the center of the image that didn’t fully illuminate the field at low zoom levels. 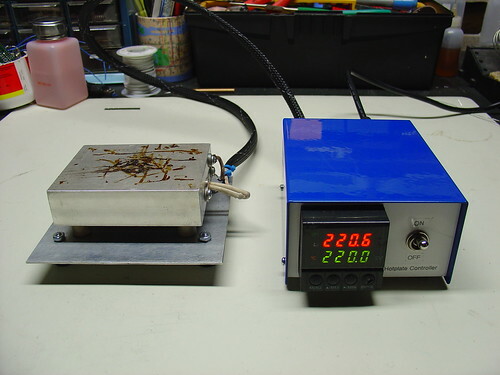 While it is removable from the scope (this provides a workaround for these issues), the included stand took up too much bench space to be practical. 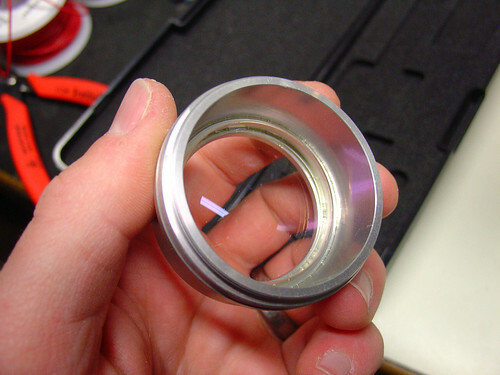 The first upgrade I made was to add a secondary objective aka barlow lens to the scope. A secondary objective serves to increase or decrease the total magnification of a microscope, while simultaneously trading off working distance, the distance between the bottom of the microscope and an object in focus on the bench. In my case, I added a 0.5x secondary objective, which gave me half the magnification while increasing my working distance by approximately 2x. 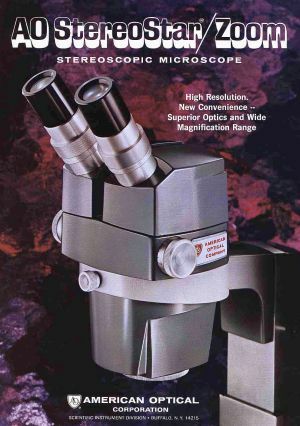 While American Optical stopped making accessories for the StereoStar 569 long ago, Reichert, who acquired AO’s microscope line, still sells parts and accesories, including the #575 0.5X secondary objective, shown below. Now with the secondary objective installed, I have a zoom range of 3.5-15X and a working distance of 6-8″. If I need higher magnification, I can always remove the lens. Perfect! The ring light conveniently attaches to the newly installed secondary objective by tightening three thumbscrews, and provides a decent amount of light that fully illuminates both the object I’m working on as well as the surrounding workbench area, which has been surprisingly helpful. Best of all, the new light stays out of the way and provides more even illumination than the halogen projector that came with the scope. The increase in working distance due to the 0.5x secondary objective is great, but it puts the scope significantly higher above the bench. I didn’t appreciate that this could be an issue until I had to buy a taller lab chair to see through the eyepieces! I’m not sure how to work around this, but it’s good to be aware that more working distance isn’t always a good thing. The color temperature of the fluorescent ring light is very poor (cool) compared to the halogen illuminator it replaced. This gives everything a slightly depressing blue cast and is far from a true color representation. Most noticeable are tantalum caps, which go from bright orange in color to a sort of slightly orange-ish dark grey under the scope. Yuck! Ring lights can create pretty nasty glare. This might be a side effect of how I have the ring light mounted or the distance to the bench. The 8W fluorescent lamp is ok, but more light would be better. Fluorescent ring lights are nice and cheap, but better performance can be achieved with a significantly more expensive fiber optic illuminator. I may look into getting one of these in the future. Despite these minor issues, I am pretty happy overall with the new setup even after a couple hundred hours of heavy use. New Stereo Zoom Microscope for my Electronics Lab! 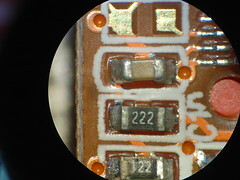 Soldering surface mount (SMT) components is tricky, particularly if you can’t see what you are doing due to the small scale of most SMT parts. Since I started working with SMTs at home I have suffered with a 10x magnifier ring-light. 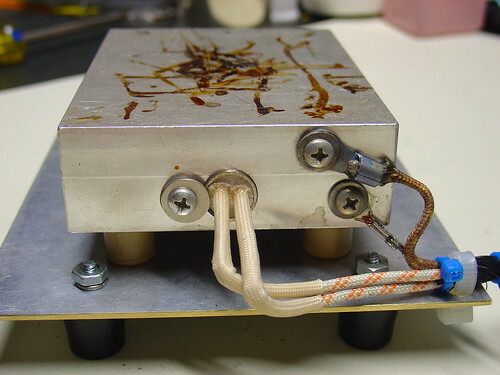 It works, but it’s tricky to use, mainly because the working distance is so small that getting a soldering iron on a part and keeping that part in focus are almost mutually exclusive. The right tool for this job is a stereo microscope. 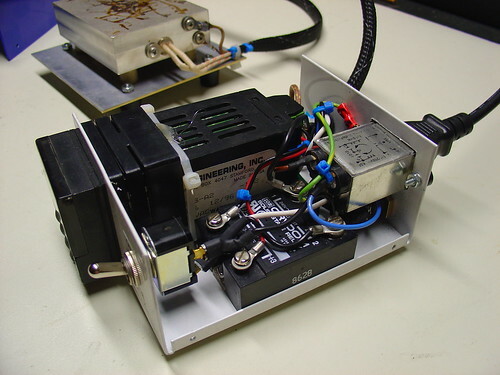 Stereo microscopes use two separate optical paths to provide you with depth perception, very helpful for working with 3-dimensional objects like printed circuit boards. Even better is a stereo zoom microscope, where the magnification factor can be changed by turning a knob instead of swapping out lenses. 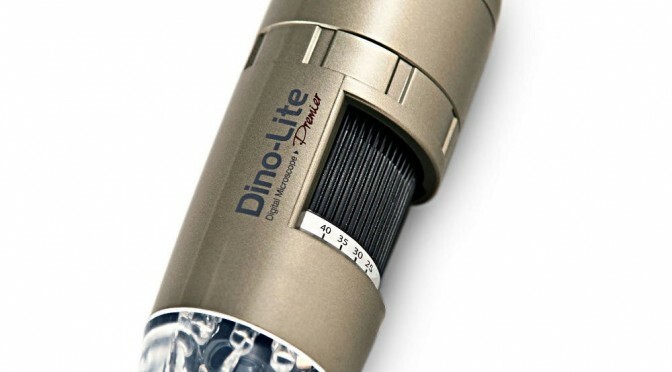 Until now I assumed that a stereo zoom microscope would be way out of my price range, at least several hundred or a thousand dollars for a very basic setup. 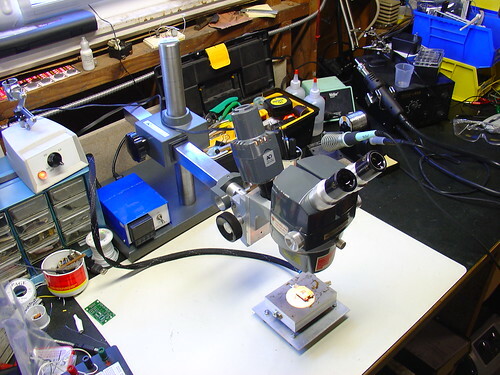 However, some searching on eBay showed that good deals can be had, and a used microscope with a boom stand suitable for surface mount work can be found for as little as $200-$300. New microscopes are available for $400-$500, although there is some debate regarding the quality of low-cost imported microscopes. Caveat emptor. 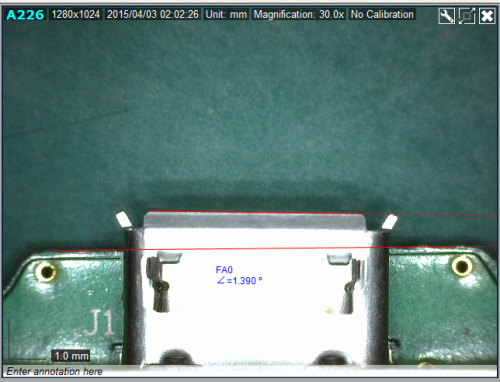 For surface mount soldering, 7-30x magnification is reasonable (that’s 10x eyepieces * a 0.7-3x objective), and a 4″ or greater working distance makes using tools under the microscope a lot easier. I ended up buying an American Optical (AO) model 569 with an illuminator and boom stand, shown below. Total cost was just over $200 with shipping. The scope is very old, it was made in the late 1970s, but it has survived in extremely good condition. Upon receiving it, I tightened some setscrews and regreased the slides and it’s as good as new, despite being over 30 years old! 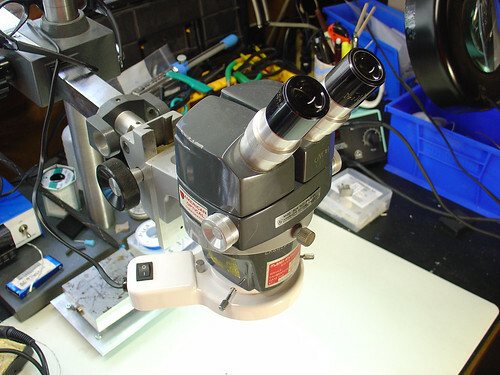 There are a few more photos of the microscope setup on flickr. The image quality is excellent. 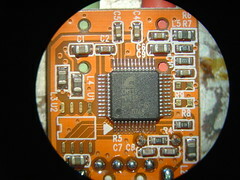 Here are a couple pictures of my SYBA USB-Audio Adapter taken with the microscope and my Sony DSC-V1 digital camera. I held the camera up to one eyepiece, set it into macro mode, and snapped the shutter – these images are straight off the camera with no retouching.